Which are the Best San Diego Beaches for Walking, Jogging, or Running? Choose your best beach. 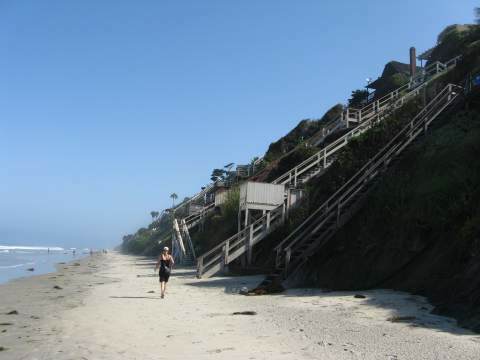 San Diego county has 70 miles of beaches to explore, most of which are accessible except during very high tides. Whether you want to run barefoot on the beach, take a power walk, or take a romantic stroll on the beach with your lover, try one of these best San Diego beaches. 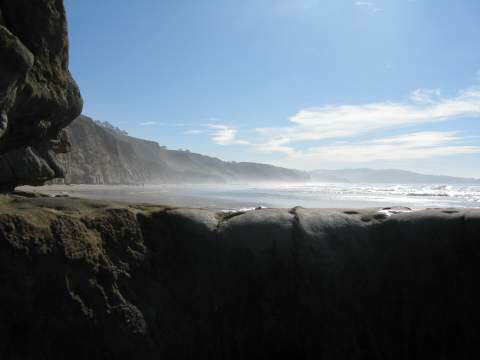 Fall and winter offer some of the best beach walking at low tides. Many beaches are accessible year around and there are overlooks and boardwalks for those who prefer not to walk on the sand. These best San Diego Beaches have great sand and the warmest water in California. The Mediterranean climate keeps the San Diego CA beach pleasant most days of the year. Come enjoy a long stretch of beach. 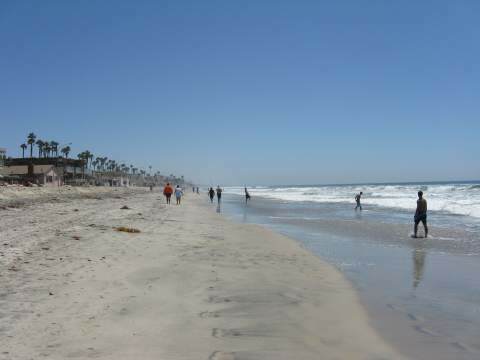 Oceanside Beach, one of the northern best San Diego beaches, you can walk along the Beach or along The Strand (road). Head north past the Oceanside Pier and you can reach the Harbor, with the collection of boats to explore. Head south and you can reach Buccaneer Beach and Park. 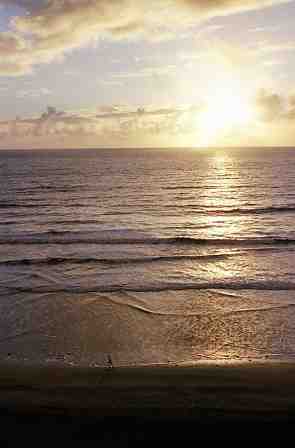 Choose a day with tides 3 feet or lower if you want to walk long distances along the sandy beach. See San Diego tide chart. Oceanside Beach Directions - From Interstate 5, go west on Mission Ave. to the Pacific Ocean. I recommend that you park in a parking lot before you get to The Strand, as parking along The Strand is limited. By Train - You can easily reach Oceanside Beach from the San Diego Coaster Train. It is 4 blocks from the Oceanside Transit Center train station. Carlsbad Tamarack Beach, also called Carlsbad State Beach, is one of the northern best San Diego beaches. At the northern end is downtown Carlsbad, with many restaurants and shops near the beach. 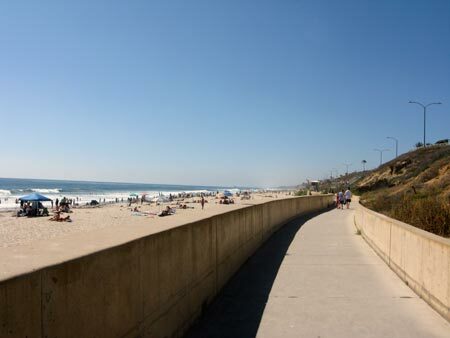 You can also walk south along the beach or the boardwalk which stretches for about 1 mile. Choose a day with tides 3 feet or lower if you want to walk long distances along the sandy beach, but the concrete boardwalk has a seawall so you can walk, skateboard, or bike along that path at high tide (see photo above). See San Diego tide chart. Driving Directions to Carlsbad State Beach Tamarack Beach - From Interstate 5 in Carlsbad, go west on Tamarack Ave. to the Pacific Ocean. There is a parking lot at the end of Tamarack Ave. It the lot is full, you will need to find parking along the street. By Train - You can easily reach Carlsbad State Beach (Tamarack Beach) from the San Diego Coaster Train. It is 3 blocks from the Carlsbad Village train station. Moonlight Beach and the 6 miles of beaches along the charming historic surfing town of Encinitas, California are a great place to walk, making them some of the best San Diego beaches for those who like to walk or run on the beach (and great for the surfers too who have their favorite surf spots). If you head north from Moonlight Beach, you can walk to Stonesteps, Beacons, and Grandview, all three entrance points to Leucadia State Beach, a long continuous stretch of beach along the cliffs. It is popular with surfers all the time, and with walkers when tide is less than 3 feet (2 feet or less is even better, especially at the tidepools near Swami's point). See San Diego tide chart. If you head south, you'll pass the D street entrance, then you can walk below the cliffs in the area known as Boneyard, then further south to Swami's surfing spot (1 mile south) and San Elijo State Beach Campground (2 miles south). From either place you can climb the stairs (the campground has lots of stairs so makes a great workout area - see photo on top of this page). For some variety, return on the road, and explore Self-Realization temple, the restaurants, shops of old Encinitas. Caution: do not walk to close to the cliffs, as they are unstable, and there are occasional landslides or falling rock. Driving Directions to Moonlight Beach Encinitas CA - From Interstate 5 in Encinitas, take Encinitas Blvd. west to the Pacific Ocean. There is a large free parking lot between B and C street just one block from the ocean. Directions to Moonlight Beach Encinitas by Train - You can easily reach Encinitas Beaches (Moonlight Beach) from the San Diego Coaster Train. It is 3 blocks from the Encinitas train station. Another great place to walk near some of the best San Diego beaches is in the Torrey Pines area. There are several very nice hiking trails with spectacular views of the ocean and La Jolla. One popular hike is to take the beach trail loop from Torrey Pines State Reserve, which merges at the beach just before a large outcropping called Flat Rock (see picture above.) If the tide is 3 feet or lower, you can usually get to the beach and walk north along the beach beneath the cliffs of Torrey Pines to the popular Torrey Pines beach. 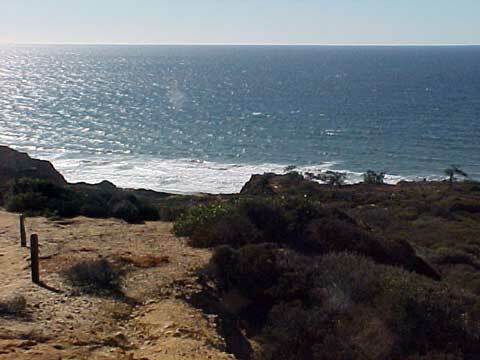 Most people choose to stay on the trails of Torrey Pines, or hike the beach north of Flat Rock. If the tide is too high, you can't get past Flatrock. Most of the time it is too high, maybe you can get around it at 1 foot or lower (just be sure you can get out before the tide comes in). Past Flatrock and you will enter the area known as Black's Beach, an unofficial clothing optional beach (see below). From I 5 go ~1.5 miles west on Carmel Valley Road, turn left on North Torrey Pines Road (Coast Highway 101) and look for free parallel parking on the west side of the road. If no free parking is available, continue south on North Torrey Pines road until just before you climb the steep hill of Torrey Pine grade, and there is a small pay parking lot on the right. Currently parking is $10 as this is a California State Park, or it is free if you have a California State parks pass. It is recommended that you park at the bottom and walk up the steep road to get some great exercise, but there are also several parking lots on top. From La Jolla Cal., take Torrey Pines Road north past la Jolla Village Drive. Continue north along North Torrey Pines Rd. past Genesee. On your left you will pass the Torrey Pines Hilton and Torrey Pines Golf Course. Just after you descend down Torey Pines grade there is a pay parking lot on the left at ocean level. We like to park at the bottom and walk up the steep road to get some great exercise (which also works well if you hike the Beach Trail, as you end back at the bottom), but there are also several parking lots on top. At low tide (1 foot or lower) you can run all the way along most of the best San Diego beaches, including this lovely section along the Torrey Pines cliffs known as Blacks Beach, considered a remote but one of the best San Diego beaches for those who like to bare it all. 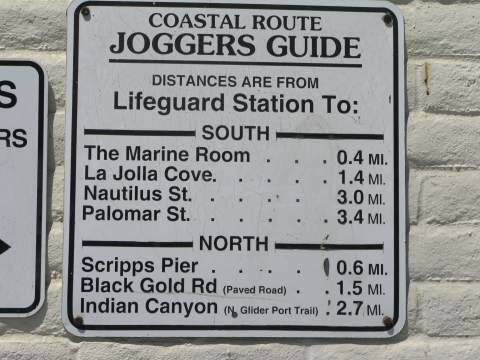 You will go through a clothing optional beach, possibly see some hang gliders or paragliders along the cliffs overhead, go past the mansions, past the tide pools, past Scripps Pier and eventually get to La Jolla Shores beach. This route is not accessible unless at low tide, and can be a long route, particularly if you need to return to your starting destination. Figure 6 miles one way, 12 miles round trip, so be sure you check the tide tables carefully. From Interstate 5 take Genesee west. Turn left on Torrey Pines Rd. then right on Torrey Pines Scenic Drive, just before the Salk Institute. Park in the unimproved parking at the end of the street at the Torrey Pines Gliderport above Black's Beach. The trail begins at the end of the parking area to the left of where all of the "unstable cliff" signs are located. La Jolla Shores is one of the best San Diego Beaches! It is popular with pretty much everyone. At low tide, you can hike north past Scripps Pier, Scripps Beach, the tidepools and to the Salk Canyon Road. This makes a nice scenic loop, but is only accessible at low tide (3 feet or less to get past the tidepools). If you go south, you'll need to head uphill a little to get past the Marine Room, but you can work your way back down to the La Jolla Coast Walk. This is a spectacular route that takes you past all the La Jolla attractions, including the Sea Caves, La Jolla Cove, Ellen Browning Scripps park, Shell Beach and to La Jolla Seals at Children's Pool, where the seal colony hangs out. All of these La Jolla beaches are some of the best San Diego beaches for their scenic beauty. Driving Directions to La Jolla Shores – from Interstate 5 go west on La Jolla Village Drive, left on Torrey Pines Road, right on La Jolla Shores Drive, then left on Vallecitos. The free parking lot near Kellogg Park is to your right. The lot fills up fast during the summer, especially on weekends. There is free street parking along neighborhood streets - sometimes I've found good parking on La Jolla Shores Drive, or several blocks on the other side of it, so you might want to unload your beach umbrella, ice chest and the gang at Kellog Park while the driver hunts for parking. Directions to La Jolla Cove from the north - From Interstate 5, go west on La Jolla Village Drive, left on Torrey Pines Road, and right on Prospect Street. Watch for the signs and bear right on Coast Boulevard (take the second entrance if the first one looks busy). Directions to La Jolla Cove from the south - From Interstate 5, go west on La Jolla Parkway, continue on Torrey Pines Road, and right on Prospect Street. Watch for the signs and turn right onto Coast Boulevard (take the second entrance if the first one looks crowded). Mission Beach, in the heart of San Diego California, has a concrete boardwalk that stretches about 2 miles from Mission Beach to Pacific Beach. It's a great place to walk on a sidewalk if you like to be where the action is. Mission Beach and Pacific Beach are two of the best San Diego beaches, and centrally located in SD. 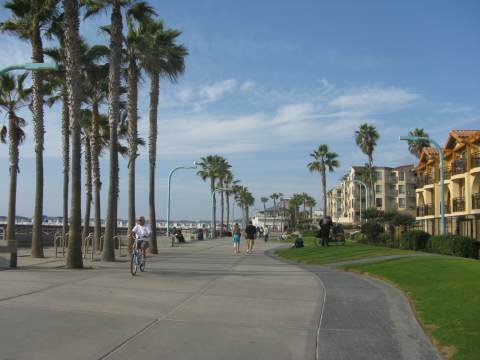 Nearby is Mission Bay Park, with miles of sidewalk and grassy areas to walk. Driving Directions to Mission Beach CA - From Interstate 5 in San Diego, take the Grand Avenue exit and go west. Turn left on Mission Blvd. Park in the free public parking lots at the north and south side of Belmont Park in Mission Beach San Diego, or at the end of West Mission Bay Drive. Driving Directions to Mission Bay Park - From Interstate 5 in San Diego, take the Grand Avenue exit or Sea World Drive exit and explore the park. On summer weekends, arrive early to find parking. You can park in the free public parking lots on Mission Blvd. at the north and south side of Belmont Park in South Mission Beach San Diego, or at the end of West Mission Bay Drive.